"Play with Love and Joy"
Based on a true story, THE MIRACLE SEASON is an inspiring sports drama about a high school volleyball team that has to step up and encourage one another when their beloved captain unexpectedly dies. THE MIRACLE SEASON is an entertaining, wholesome movie, with a strong Christian message about loving and encouraging each other in the midst of hardship. Based on a true story, THE MIRACLE SEASON is an inspiring sports drama about a high school volleyball team that has to step up and encourage one another when their captain unexpectedly dies. THE MIRACLE SEASON is an entertaining movie, with a strong Christian message about loving each other in the midst of hardship. Caroline is an effusive, fun loving, happy go lucky high school senior. She and her best friend, Kelly, play on the volleyball team. This is a big year for Caroline, because she’s a senior in high school and the team captain. Sadly, however, her mother is very sick and in the hospital. Caroline loves inviting friends over to her family’s barn, to hang out and have fun. After they have everyone over, Caroline decides to take a moped out to see her mother at the hospital. Waving goodbye to her friend Kelly, Caroline rounds the corner in the moped, never to be seen again, due to hitting a tree and instantly passing away. Everyone is completely crushed, including Kelly and Caroline’s father, Ernie. Very shortly after this tragedy, Caroline’s mother also dies. Kelly and the other volleyball team players don’t want to continue playing volleyball, but their female coach convinces Kelly that she must lead the team to play again. Deciding they should do this in Caroline’s honor, Kelly convinces the other players they must try to win the State Championship for the second year in a row. At this point, morale is low, they have lost one of their best players, and they don’t know if they can do it, but they will try. THE MIRACLE SEASON has a strong, inspiring Christian worldview. The father in the movie gets angry at God after his wife and daughter die, but in the end, comes to terms and thanks God for the blessings in his life. Caroline was a positive figure that encouraged people to love one another, no matter what. Consequently, the movie has a positive, uplifting message about encouraging and loving others. THE MIRACLE SEASON is a well-made movie that’s entertaining, wholesome and even fun, despite some heavy subject matter. The acting is also very good. The tragedies in the movie aren’t overbearing, so moviegoers who don’t like that sort of thing won’t have to sit through a lot of depressing scenes. 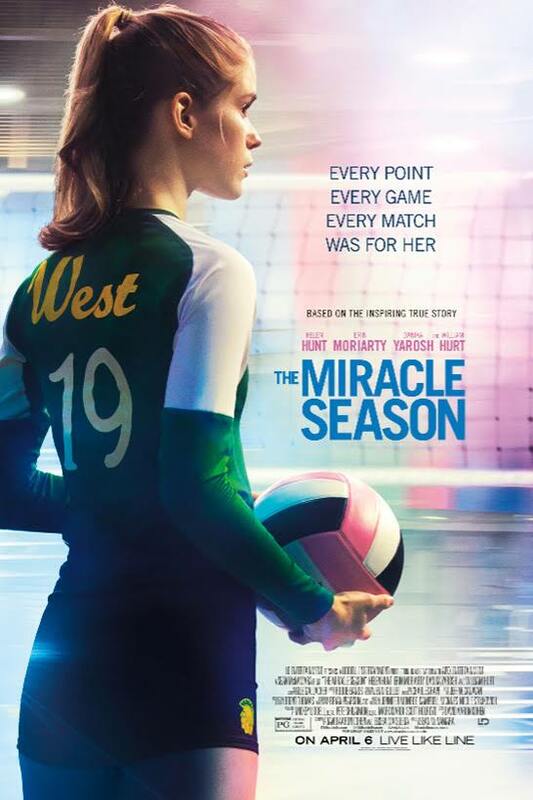 Based on a true story, THE MIRACLE SEASON is an inspiring drama about a high school volleyball team coping with a tragedy. Caroline is beloved captain and believes this year will be great. Sadly, Caroline dies in an accident. The entire team is distraught and doesn’t want to continue playing volleyball. The female coach encourages Caroline’s best friend, Kelly, to play in honor of Caroline. Kelly’s able to convince the other girls on the team to do the same. Will they be able to win the State Championship again, despite their grief over the tragic loss of their best player? THE MIRACLE SEASON is a well-made movie that’s entertaining, wholesome and even fun, despite some heavy subject matter. The acting is very good. Best of all, THE MIRACLE SEASON has a strong, inspiring Christian worldview. The father gets angry at God after his wife and daughter die, but in the end, he comes to terms with this great loss and thanks God for the blessings in his life. Finally, THE MIRACLE SEASON has a positive, uplifting message about encouraging and loving others.